Mindfulness training involves sitting comfortably and silently focusing your awareness on an anchor. It's important to use a soothing anchor, such as the breath during mindfulness meditation. Just notice the cool sensations of the in breath and the warm sensations of the out breath. You do not need to do anything to alter your breathing pattern. What is most important is that the breath is always with you and when you get lost in a thought or feeling, you can notice this entanglement and then return your attention back to the breath. As you continue to focus on your breath, you will repeatedly find your attention drifting, as thoughts, feelings or sensations come into your awareness. That's totally OK and to be expected. 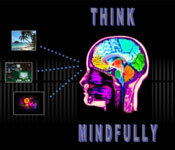 The goal is not to prevent yourself from having thoughts, feelings or sensations during mindfulness practice. The goal is to notice the distractions that arise and then to gently turn your attention back to your breath.